Don’t get too excited about £73m Florian Thauvin price tag – Have you seen the others? You may have seen a few headlines in the last 24 hours talking about how Florian Thauvin is now valued at £73m. Bottom line though, as we all know, is that any player (or other commodity) is only worth what somebody will pay at any particular time. I can claim that my house is worth a million quid but that is just guesswork, or rather, a lie, unless somebody actually gives me the cash. The most anybody has ever paid for Florian Thauvin is £13m and that was Newcastle United back in Summer 2016. Returning on loan to Marseille in January 2016, the winger was average at best, but last season and this one so far, he has been their star man and scored & created a lot of goals. Is he worth £73m though? Well no, or at least I very much doubt it. The £73m Florian Thauvin valuation is simply a figure thrown out there by the CIES Football Observatory. They put out some interesting football stats stuff, including on the financial side of things, but when it comes to things like valuing clubs and especially players, they just use a certain system that puts weight on different stats, then throws out these amounts. 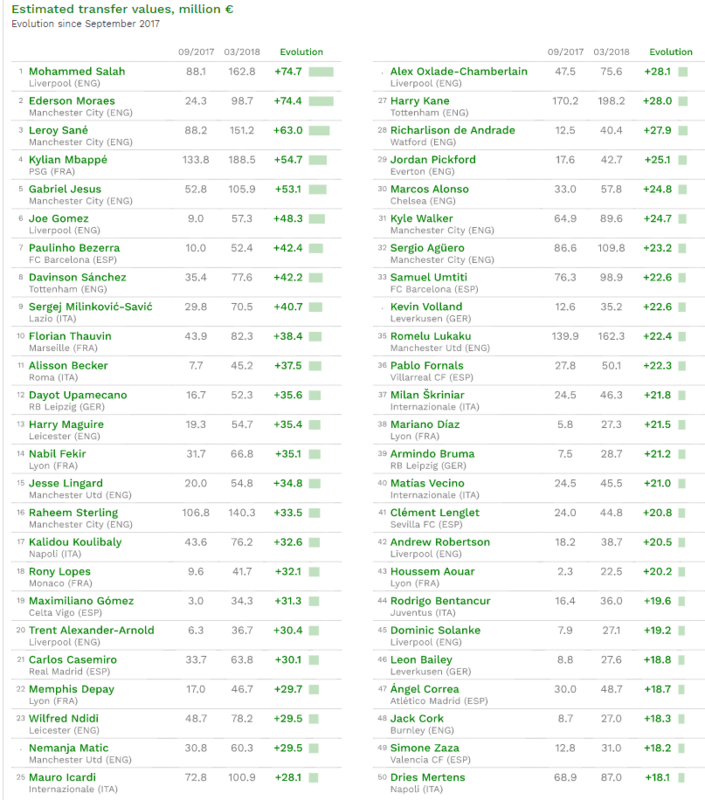 As you can see, there are some ‘interesting’ valuations of other players as well. Alex Oxlade Chamberlain cost Liverpool £35m last summer and is now ‘worth’ £68m, even though he struggles to get a game (13 starts out of 30 PL games). Sticking with Liverpool, Andrew Robertson cost £8m last summer and is now £35m (started 17 PL matches for Liverpool). Do you really think somebody would now pay £146m for Romelu Lukaku? Harry Maguire at Leicester now worth £49m? Nemanja Matic at £54m despite turning 30 in August? Wilfred Ndidi increased in value from the £16m paid for him 18 months ago, to now worth £70m after 47 Leicester league starts and 2 goals?